By Pedro Nuno Ferreira Health and well being are strongly influenced by environmental conditions. In humans, one can take examples of large scale epidemics, such as plague, cholera, etc… that have been caused by very poor sanitation and hygiene conditions. Sanitation structures and processes as well as hygiene habits have been developed and evolved over time with major advances seen in the last century. We nowadays treat industrial and domestic water effluents prior to launching them into the rivers, lakes, and seas and the same goes for solid wastes and fumes. Personally I am involved in such activities since one of my professional responsibilities is environment management and it has been one of my main objectives to find ways and solutions for the industrial residues produced. Basically, I try and have been successful in either valorizing or recycling them. Laws exist to make sure that sustainable environmental practices are followed and society’s awareness is more and more conscious and proactive in this regard. Well this is not new for nature, in fact it has been in place long before we existed as a species and only so could nature maintain a sustainable and continuous evolution that is subject to cycles, ups and downs, but all pieces fall into place and life on Earth continues. We now hear and talk much about global warming, human interaction and contribution to that, etc… well it is so, but not only so, for in nature with or without human species, these changes also take place. One of Earth’s history periods that fascinates me the most, is the Permian mass extinction and the Siberian traps… an estimate of 94% of marine life extinct and 70% of land life extinct. 1 million years or more of volcanic activity, all environments completely disrupted and life on Earth almost wiped out. But once the volcanic activity ended, things started to fall in place and new life forms evolved from the ones that survived and lasted until the next mass extinction event and so on. Despite the fact that these cyclical events are a natural dynamic of a living planet such as is Earth, a dynamic strongly powered by its tectonic plate movements that can alter ocean deep currents, atmosphere composition, etc. we as humans also play a role in it and thus must act in such a way that wastes are treated and rendered non noxious to us and the environment as well, thus promoting a sustainable and healthy environment to live in. The scenario above is not much different from what has to be achieved in our closed aquarium systems or simply they will not be sustainable and all life in them will degrade and perish. The living organisms that we keep have nutritional needs that have to be met for them to survive but in consequence they process such nutrients and produce wastes that have to be in turn processed and rendered innocuous and this all in a balanced way or simply the closed biotope will not be sustainable. These wastes are produced through what is called the nitrogen cycle … these wastes are NH3, NO2, NO3, PO4 … and they all have to be exported out of the system either by conversion by specific organisms that use them as an energy source and/or removed by chemical, or mechanical means. Otherwise if left in the closed biotope they will build up quite fast to a point that they will simply become noxious to the life forms in the system and end up killing them and causing the system biological collapse, a bit like what happened on a very large scale during the Permian extinction. 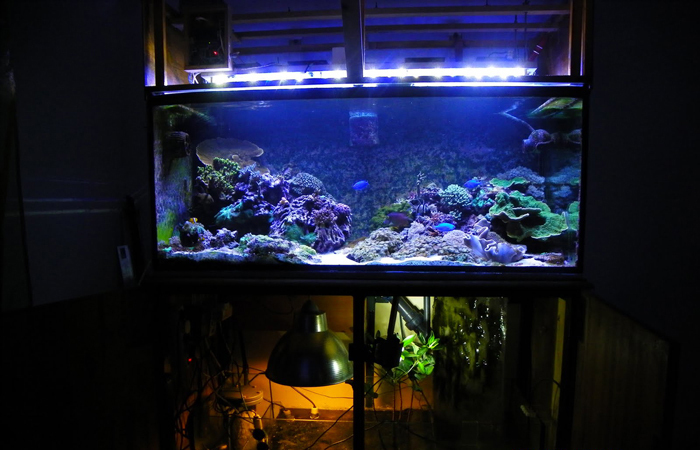 This balance between nutritional needs and waste processing has been a big challenge over the years but Human endeavor has progressively overcome many of these problems and the same goes for reefkeeping. Nowadays species that were nearly impossible to keep are now kept. There are now many more solutions and a better understanding of nutrient export than ever before. The techniques themselves as you will read below are not so new for the most part, but understanding and knowledge of how they work and how to use them, has developed considerably. Effective use of these solutions however ought to be planned for beforehand, and this planning has to take into account the organisms we intend to keep, as well our life style, our knowledge, habits, willingness and time available to perform husbandry as well as our wallets. So, what are these new solutions? If we do a retrospective analysis of the common nutrient export solutions we will find out that after all the new solutions are not so new for the most part. In fact, several of these techniques were available for quite a long time, only they were not completely understood and/or well used. In a retrospective view let’s see the pieces of this nutrient export puzzle. The Natural System Approach Back in the 1950’s Mr. Lee Ching Eng came up with a solution called the natural system that in short, used natural reef rock, later and nowadays called live rock, which he could collect locally as he lived very close to the sea in Indonesia, it used natural sea water which was changed on a regular basis, it used sun light and air pumps to promote water movement and oxygen supply to his closed systems. This worked and can still work if one has unlimited access to these natural resources and sets up a system that is balanced in all aspects–no overstocking, no overfeeding, etc— and has a lot of time and patience to do so! Therefore, it is not surprising that in the early 70’s enthusiasts all over the planet, tried and failed to keep such systems, because they didn’t fully understand the dynamics and limitations of the methodology. Consequently, the method was widely dismissed as not feasible, but it is feasible, although quite demanding in terms of both natural means and time and requires a lot of self discipline to achieve good results. Jaubert Plenum System Approach and Deep Sand Beds The Plenum method was devised and used by Dr. Jean Jaubert at the Musée Oceanographique du Monaco and is referred to since then as the Jaubert System. It is based on the creation of a non oxygenated layer of water trapped beneath a deep layer of gravel or sand at the bottom of the aquarium. This water layer is trapped so it is anaerobic and the bacteria growing in it remove nitrates from the aquarium. A deep sand bed can be defined as a bed of fine sand, 1mm grain size (larger size particles promote higher water circulation which is not good for creating an anaerobic environment), with a minimum depth of some 10 to 15 cm which ensures that a significant part of it will have low to very low water circulation, thus creating the conditions for anaerobic bacteria settling which will break down nitrates into nitrogen gas. In addition to this, the deep sand bed will house many sand dwelling organisms like worms, crabs, snails, that will consume wastes from the fishes and corals and promote the water circulation deeper into the sand bed, thus contributing significantly to the sustainability of the system. Deep sand beds can be placed in the tank itself or remotely in the sump. These Plenums and deep sand beds are often combined with mangrove and/or algae to further promote their capacity of removing wastes from the system by using them as a food source. It can be understood that these Plenum and deep sand bed approaches do work when setup and maintained properly, but they can be demanding to keep and are complex biotopes that can be easily disrupted. Still, they remain popular. The Berlin Method Approach This method is based on the use of a significant volume of live rock which contains bacteria and marine organisms just like the natural system approach mentioned above. The bacteria on the surface of the rock are aerobic and convert the harmful ammonia into nitrites and then nitrates which in turn move through diffusion deep into the live rock where anaerobic bacteria convert them into nitrogen. Through partial water changes the remaining nitrates are removed. The protein skimmer is an added measure to remove from the water column some of the dissolved organic compounds before they are broken down into ammonia. This method although widely used for many years, requires a large amount of rock to sustain the system and in time the rock can lose some or a significant part of its effectiveness, often compensated by replacing the old live rock with fresh live rock and/or the use of bacterial suspensions. Water changes with natural sea water or a quality synthetic salt mix play a very important role to maintain essential elements and trace elements and remove partially some undesired nutrients. The use of calcium reactors, Kalkwasser reactors or two part solutions will supply in a controlled way the needs for the corals consumption. Live rock provides a natural reef appearance with ample places to site corals as well as provide shelter for the fish and crustaceans, snails, worms, etc. As it can be understood, this widely used biological filtration method has its limitations related to volume and space needed place the live rock to sustain the system as well as the possible loss of effectiveness over time as bacteria populations may decrease in numbers if not replenished or if impacted by water parameter degradation thus impacting the sustainability of the system. It is perhaps the most widely approach never the less, and now its dynamics are better understood. The Algae Scrubber Approach An algae scrubber is a water filtering device that uses light to grow algae which will remove undesirable chemicals such as NH3, NO2, NO3, PO4 from the water by primary production in a way similar to oceans and lakes. It can be both used for fresh and marine waters. Water is driven over a rough highly illuminated surface where algae grows in large amounts and these in the presence of atmospheric CO2, consume massive amounts of nutrients. The algae are then removed on a regular basis and in doing so, with them the nutrients that otherwise would build up to dangerous levels in the closed system of an aquarium. 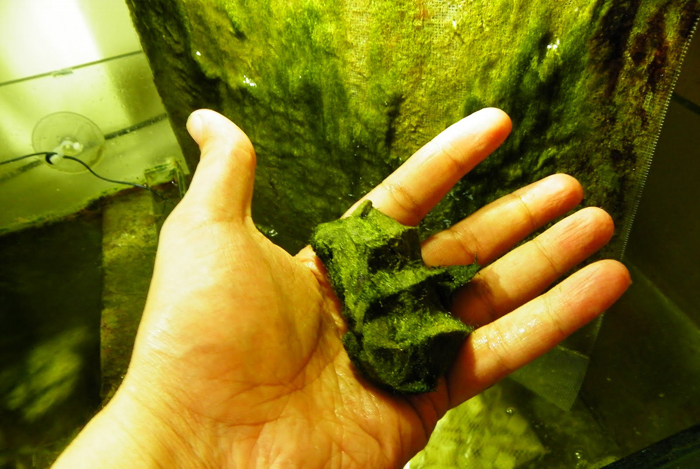 Invention of the algae scrubber is attributed to Dr. Walter Adey back in the late 1970s, at a time he was the Director of the Marine Systems Laboratory at the Museum of Natural History, Smithsonian Institution (Washington DC, USA). Back then Dr. W. Adey was researching various types of algae and this led him to try to understand how the ocean “recycles” nutrients. He built a very successful public aquarium at the Smithsonian, a 130 gallon (456 liter) coralreef system that after 8 years of closure to the environment had its chemical parameters controlled solely by an algae scrubber. This system was studied by a multidisciplinary team of biologists which ranked it as the most biodiverse reef ever measured—nutrients such as NH3, NO2, NO3, PO4, are recycled in it by the algae, they go from algae to animals and back to algae again. Dr. Adey built several versions of algae scrubbers for aquariums at the Smithsonian which he called Algal Turf Scrubbers since at the time it was believed that “Turf” algae were the best type of algae to grow in a scrubber. This was the 1st US patent for an algae scrubber, and it described a quite complex dumping device that poured water onto a horizontal surface. 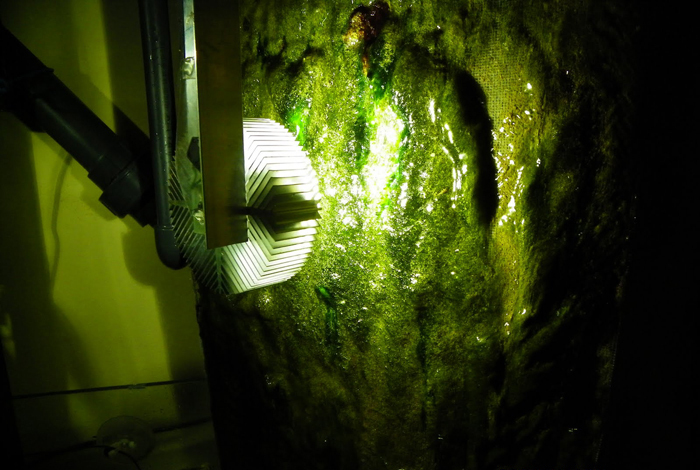 Dr. Adey participated in a test of a large scale algae scrubber on the great barrier reef aquarium and in doing so represents the first application of algal scrubber technology to large volume aquarium systems. Aquaria that use bacterial filters methods, generally have nutrient levels in parts per million, while with algae scrubbers these are kept at parts per billion concentrations despite the heavy biological load. The suitability of the algae scrubbers was demonstrated by the spawning of the scleractinian corals and many other aquarium inhabitants. Dr. Adey licensed his patent to some individuals and for a short number of years they sold a reduced number of scrubbers to aquarium hobbyists, but the complexity of the design and license costs impacted the sale price, so this high price combined with the fact that these units were noisy and unreliable as the dumping mechanism would get stuck, caused the sales to drop and Dr. Adey withdrew the licenses at a time when these scrubbers were starting to make their headway into the aquarium hobby in the 1990s. Dr. Adey turned his attention to commercial and industrial applications and entered private business producing large scale scrubber installations. 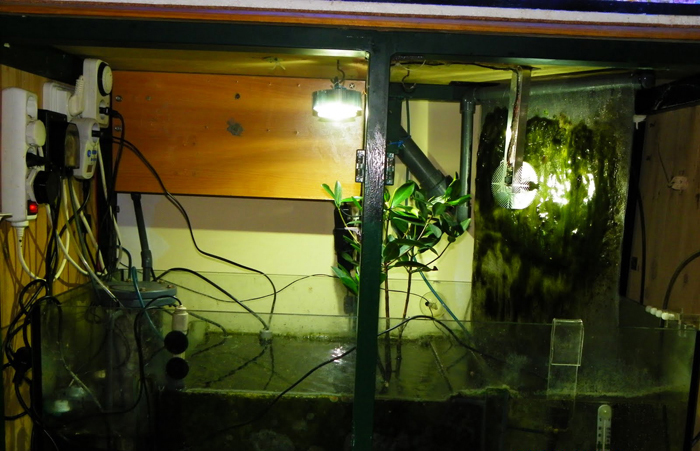 The algae scrubber was to remain largely dormant for the reefkeeping and aquarium hobby for many years, however the effect of algae did not go unnoticed since hobbyists begun to discuss nuisance algae problems and noticed that ponds, lakes, aquariums with very high amounts of nuisance algae had no detectable nutrients in the water. So what seemed odd at the time was analyzed and a relation was established between the increase of nutrients in the water leading to the increase of nuisance algae and that because the algae consumed the added nutrients faster than these were added, thus no detectable nutrients in the water. This sparked the interest in using algae for nutrient control, but this time the algae were to be kept out of the display aquarium and set in such a way it would be easy to remove them. The sump seemed the perfect place and the returning water from the display was the source to feed the modestly lit algae. Later developments ended up with a DIY vertical device made by a hobbyist that could not find the algae scrubbers as they were no longer on sale. Many hobbyists now build their own kits such as the case of the one made by António Vitor and depicted in the photographs and videos he made and kindly ceded for this article. This new generation of algae scrubbers is proving quite effective and inexpensive to both buy and operate. leds sump, jovens cardinais, algae scrubber, e macroalgas e mangal. Photos and videos by António Vitor – www.reefforum.net & www.manhattanreefs.comCarbon dosing and Bacterial strains adding approach In the recent years the use of carbon sources such as ethanol (mostly Vodka), but also from sugar and vinegar, have been used quite successfully to feed bacteria and thus promote their activity to remove NO3 and to a lesser degree PO4. It has been understood that bacterial populations have to be continuously replenished and sustained to ensure a continuous and good biological filtration so more people resort to this practice with good results instead of replacing the old live rock with fresh live rock. Some people even remove the Live rock to the sump or out of the system so that they can setup a minimalist aesthetic display. Well, the truth is this approach is also not so new, as bacterial suspensions were available back in the 90s and also bacteria food. 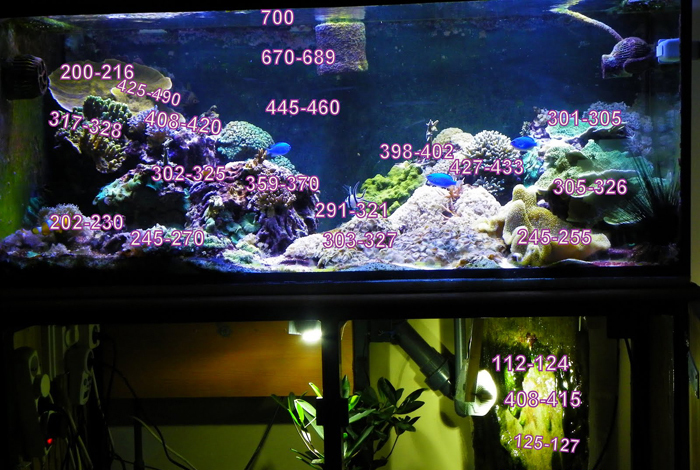 The difference as I remember it, is that back then they were mainly and almost only used as a starter set for newly set aquariums, even if some brands stated that addition should be done on a regular basis for the system maintenance and sustainability. Bio degradable plastics/polymers Plastics … a lot can be said about them, and I will not enter into details about plastics history and types of plastic other than the biodegradable ones which are the ones we deal here with. The use of plastics became overwhelming up to the point that we could be “drowned” in them if actions were not taken. In fact, plastics are a waste problem and we could not simply continue to put them in landfills and forget about them just like that as they take centuries to degrade. Biodegradable plastics or polymers showed up as a solution for this problem. Well it took not so long for these to be used as means to cultivate and feed the needed bacteria that break down among other things NO3 and PO4. These “biopellets” are also designated as solid vodka or solid carbon sources. But even these are not so new as they were already in use for quite a long time now in some nitrate reducing reactors. Their use is becoming more and more popular because they operate in a more easily controlled aerobic environment and act quite fast. GFO – Granular Ferric Oxide Granular Ferric Oxide has been used for quite a long time to treat water—more exactly to remove highly toxic arsenic and other unwanted contaminants like PO4 from water . This is a practice used in water plants that has been extended to reefkeeping and progressively gains popularity over the last few years. It can be used in many ways, but the one most favored is inside a reactor so that the grains are continuously moved by the water injected through it. Results are quite outstanding and PO4 levels can be reduced to almost undetectable levels. The biggest drawback is the continued cost of replacing the exhausted media. Conclusions So after this retrospective trip what is in fact new? Well very little is new. What is new is our understanding of the biological filtration dynamics and needs applied to the husbandry needs to maintain a sustainable and healthy closed aquatic biotope. We now understand better these dynamics and know how better to set up the structure of support to set it to work. I will not be surprised if in the near future this understanding and mastering of these techniques leads to enabling the keeping of very demanding critters like some gorgonians that require constant and heavy feeding. Mastering and controlling the system biological ability to rapidly export the nutrients that result from the heavy feeding and even overstocking will make the difference, just like it does when industrial and urban effluents are dealt with for treatment to assure a healthy environment for humans. It becomes clear that the singly or combined use of nutrient export techniques as well as the careful plan of their use will make the difference. We have to carefully study and define which of them to use in our given situations. The old really can be the new as we further understand the limits and advantages of different approaches and learn to employ them strategically in an effort to balance the import and export of nutrients in our aquariums.